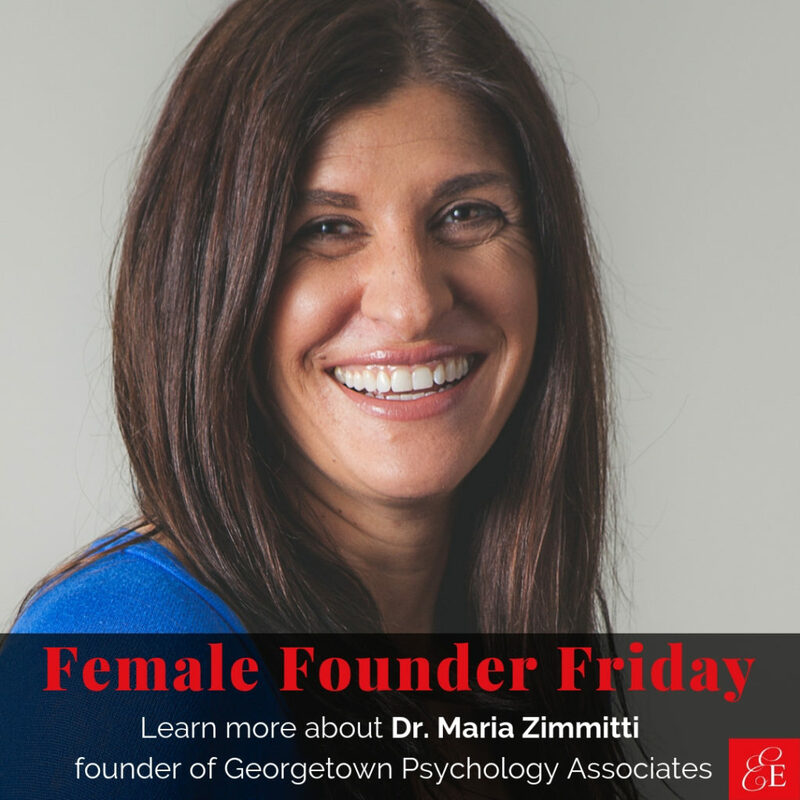 It’s Female Founder Friday and I’m delighted to share the startup story of Maria Zimmitti. Maria is the psychologist and woman entrepreneur behind Georgetown Psychology Associates. Her three offices provide diagnostic evaluations, therapy and neurofeedback services to children, teens and adults in the Washington metro area. Maria is brilliant, energetic, honest, and humble about her journey, her family, her failures and her successes. So, if you’re struggling to bridge the world of work and family or curious how to approach running a business without an MBA, don’t miss Maria’s candid answers and sage business advice below! As a psychologist, I have always been passionate about helping children and parents. Making a positive impact on a child’s life is what motivates me each day. On a personal note, I created my company to bridge the world of work and family. When I was working on my own, I essentially worked all of the time. As the business grew, I put together an incredible leadership team which allowed me more flexibility and more time at home. Maintaining balance is not always easy and my kids will tell you they find me in my office writing reports some weekends, but the overall balance works most days. I started a version of Georgetown Psychology 15 years ago and it essentially failed. While our revenue was high, I had no idea how to run a business (I went to school to be a psychologist, not a CEO) and my profitability suffered. We were so busy that I had to stop providing clinical services and manage school contracts. The model was not working and I made the decision to downsize and regroup… while I was 8 months pregnant. I gave myself some time to breathe and get back to what I love doing which is working with parents and children. About four years later, with encouragement from my husband who is also an entrepreneur, I slowly began to scale my business. This time, I had a clear vision and plan and we’ve been realizing that vision ever since. I am a true believer in the power of positive thinking and believe that my business has grown because I focus on my vision for my company and the positive impact we have on our clients. That said, it’s not always easy. Fears pop up, usually around 3:00 AM! I am afraid of failing, expanding too quickly and causing instability in my business. I am responsible for the livelihood of many people which is a great motivator and at times a source of anxiety. I don’t allow myself to live in the fear too long. I remind myself of the quote (although I’m not sure who said it first) that worrying is like praying for something you don’t want to happen. I replace the worry by looking at my vision board which I keep as the screensaver on my phone. We are in the process of launching our neurofeedback center in all three offices! We have seen the positive effects of neurofeedback for children, teens and adults and are very excited to offer this service to our clients. I have two things that made my life much easier both personally and professionally. The first was hiring an assistant. It was so scary because it was the first hire that didn’t produce revenue, but it was hands down the best business decision I’ve made to date. It freed me up to do clinical work and spend more time working on the business. My second hack was bringing the gym to me. I hired a trainer who comes to my house, and I purchased a Peloton. No excuses and I get to be home. “Unwritten,” by Natasha Bedingfield would be my theme song. It’s been a long time since I’ve heard it but it’s essentially a song about taking chances, being present in your life and embracing the future. Find your people. I had no idea there was so much support for entrepreneurship. I often felt so alone in the process. It was only recently that I found my people. I joined Entrepreneurs Organization (EO) and have been overwhelmed by the support and learning opportunities there. One thing I’ve learned is that someone has been through what I’m going through and hearing about their experiences has helped me to make better business decisions.